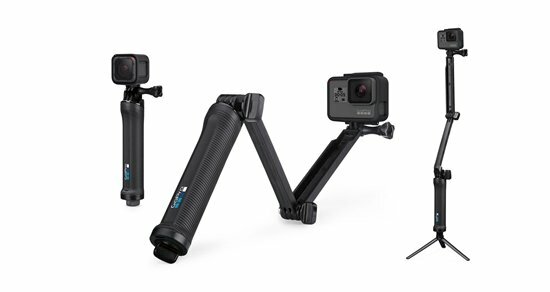 The GoPro 3-way was designed to work as a camera grip, an extension arm, or a mini tripod. It features a collapsible design that measures 7.5" when folded, and can be expanded up to 20" when fully extend. The extension arm is foldable to help you get the right amount of reach, or it can be removed entirely if you just want to use the grip part. Tucked conveniently away inside the hand grip is a mini tripod that connects to the base, or even directly to your GoPro's housing. With the 3-way mount, numerous shooting opportunities are possible. Use the grip, or grip with extension, as a handheld shooter for following action on the move. Use the extension as a selfie stick, capturing self-portraits while keeping the camera and mount out of the shot. Or extend the camera so you can get an overhead shot, or to capture from hard to reach spots. And for the most stability, where the camera is stationary, use the tripod mode and let the action fly past you.